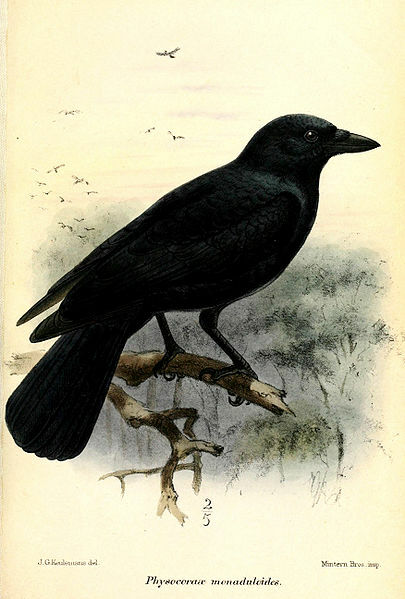 The 7 o’clock news on Radio 4 on Monday, October 7 included an intriguing item, far too short and incomplete, on the remarkable tool making and using capacity of the New Caledonian crow. The item referred to new research by scientists at the University of St Andrews led by Dr Christian Rutz on the crows’ use of hooked tools – they are the only species, apart from man, to use them. The latest findings were written up in Philosophical Transactions of the Royal Society. It refers to the birds using hooked sticks to prize out insects from their hiding places. They are not using guesswork in deciding where to the point their tools. The researcher say the crows weren’t fooled when presented with upside down or double ended tools. This very smart bird has been studied for some time. There are many references on the Internet to the work by different researchers around the world on the intelligence of the Caledonian crow. It was a subject of David Attenborough’s Life of Birds series in 1998. I mention it in an article I wrote for the PBS website to accompany the series. “On the Pacific island of New Caledonia, the crows demonstrate a tool-making, and tool using, capability comparable to Palaeolithic man’s. Dr Gavin Hunt, a New Zealand biologist, spent three years observing the birds. He found that they used two different forms of hooked “tool” to pull grubs from deep within tree trunks. Dr Rutz’s team has taken the research further, using a “range of innovative research technologies”, including miniature animal-borne video cameras, which provide a crow’s-eye view of undisturbed tool-use behaviour. My free e-book on David Attenborough includes an account of the making of Life of Birds.